Display notorious bounty hunter Boba Fett on your wall! Highly collectible Star Wars giclee on paper. Beautiful piece of artwork by Mike Kungl! Limited edition of only 95 pieces. This stunning Star Wars Boba Fett Hunter Paper Giclee Print is an absolutely beautiful piece of artwork by Mike Kungl. 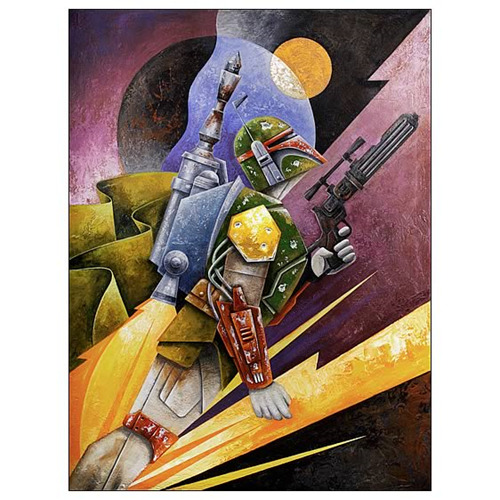 The stylized portrait of the notorious bounty hunter blasting through the air would look amazing on any wall of your home or office. Printed on paper and measuring 19-inches tall x 13-inches wide, the highly collectible Star Wars giclee is a limited edition of only 95 pieces.